The Atomic Kitten Salon at 1920 EYE Street. Next door to Sandrini's Italian and Basque restaurant and bar. 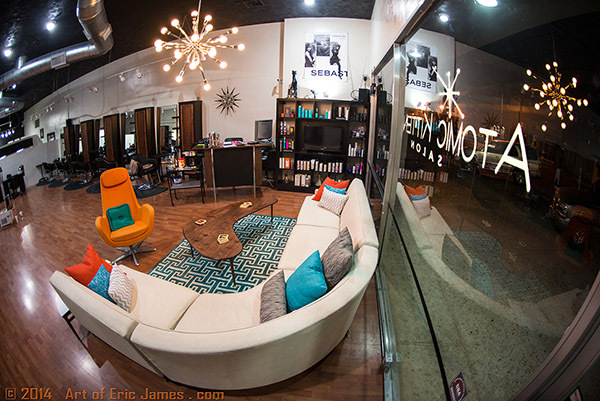 Atomic Kitten Salon is a "Retro" hair salon with an all new Mid-Century Modern interior decor. Our hair stylists specialize in unique designer looks, providing clients with the latest modern day trends or the classic "pin-up" styles from the past. The Atomic team of stylists can create the exact look you need for whatever the occasion. Atomic Kitten salon also provides full service nail art manicuring and has a certified esthetician available for your skin care needs.